Know, O Prince, that in an age undreamed of, shining kingdoms lay spread across the world like blue mantles beneath the stars. Hither came Conan the Cimmerian; black-haired, sullen-eyed, sword in hand, a thief, a reaver, a slayer, with gigantic melancholies and gigantic mirth, to tread the jeweled thrones of the Earth under his sandaled feet . 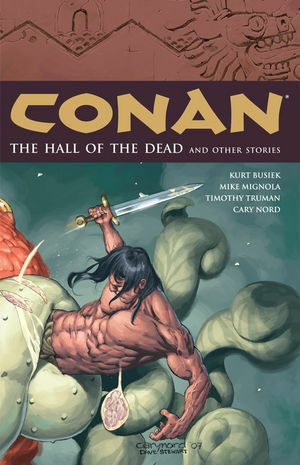 . .
Conan: The Hall of the Dead concludes writer Kurt Busiek's (JLA/Avengers, Astro City) critically acclaimed run, paving the way for new writer Tim Truman (Conan and the Songs of the Dead) and featuring a story by Hellboy creator Mike Mignola! Eisner award-nominated artist Cary Nord (Daredevil), and Eisner award-winning color artist Dave Stewart (Ultimate Fantastic Four, DC: The New Frontier) continue their groundbreaking run on Dark Horse's best-selling Conan series with three of the best writers in comics today.